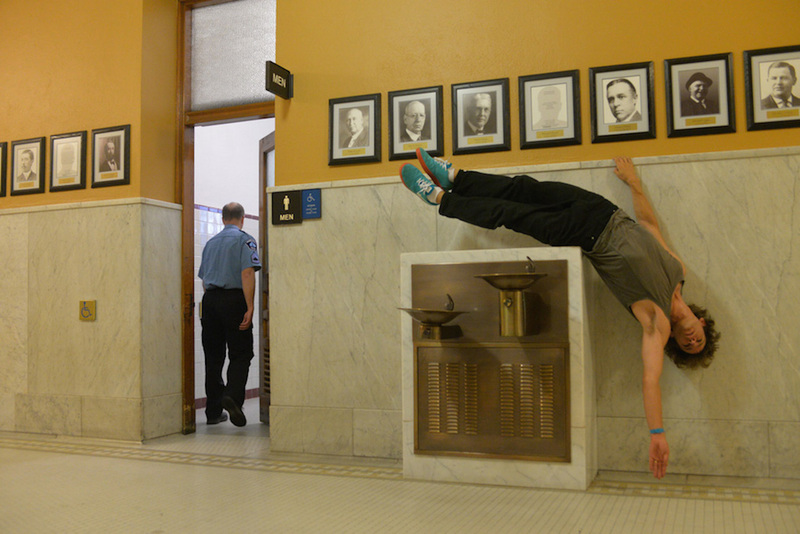 Susannah Schouweiler reports back from her discombobulating, one-on-one performance of “closer” by BodyCartography Project in Minneapolis’ City Hall. For the past couple of months, the artists of BodyCartography Project have been dancing, free of charge and one on one, for audience members at various public sites around the Twin Cities. I arrive for my own performance of closer at Minneapolis City Hall, a stately, imposing edifice occupying a full block of real estate downtown. Specifically, I’m directed to the rotunda: I walk in under a vaulted ceiling soaring five stories above my head, and am immediately dwarfed by the scale and opulence of the place. It’s the sort of space that hushes you for a moment upon entrance. I feel a mix of civic pride and personal insignificance in such a place. The performers have a table set up at the rotunda entrance, just in front of Larkin Goldsmith Mead’s Greco-Roman sculpture, Father of Waters. I check in with the artists and meet my assigned dancer, Otto Ramstad. He’s informally dressed, shaggy as a college student in his comfortably worn gray t-shirt and black jeans. I’m directed to follow him through the building, as close or far from his dance as I’d like. First, he heads for the grand staircase at the center of the rotunda and collapses himself across the bannister; he climbs up partway and then lays himself on the stairs, head down, his back sliding step by hard step to the base again. And then he’s scaling the stairway once more, buoyant. Upstairs, his initial movements down the hallway are as purposeful as any office worker’s. He has the confident mien of a tour guide – arms outstretched, sometimes pointing, to indicate architectural details and the occasional bits of interesting signage (e.g. “enter here for gun permits,” “appeals”). But then he staggers abruptly and his bright blue Nikes squeak, startlingly loud on the marble, with the quick change in direction. He tilts his head and leans precariously, listing from side to side down the hall. The zig-zag stride cuts into a sway and twitch, reminiscent of the unpredictable gait of someone drunk or mentally ill. He climbs furniture, sometimes the walls; he inhabits the space athletically in a way that transforms its confines. His movements alternate seamlessly from controlled poise to loose lack of inhibition. I’m always aware of my proximity to him, exquisitely sensitive to the transgression of moving in other than straight, decisive lines in this buttoned-up space. Depending on where I move in relation to him, I’m alternately implicated in or innocent bystander to these violations of workaday norms. In the end, I choose collusion in his performance rather than distance; that is, I’m visibly close enough to be recognized by passersby as part of the action. I’m caught in the gazes he draws with his more erratic movements, but also unprepared for that attention, unsure what comes next. 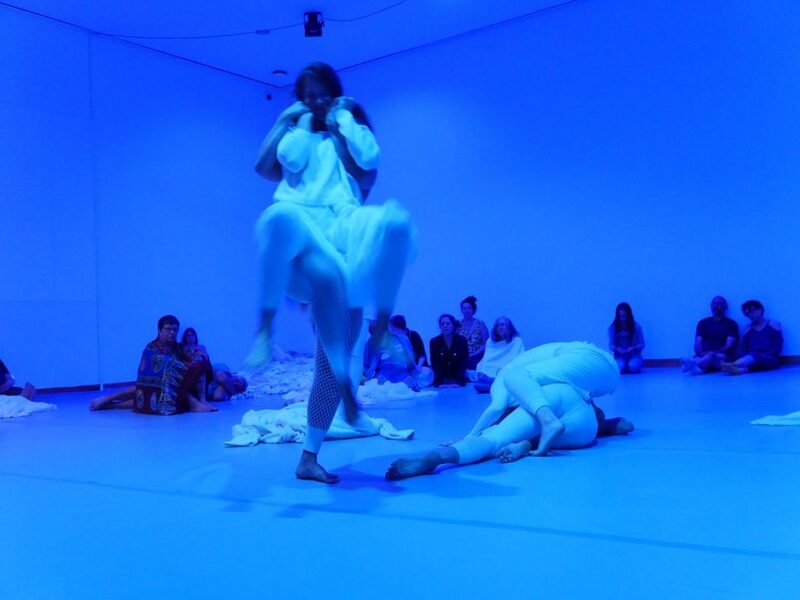 Throughout the 15-minute performance, my engagement can’t be merely passive. As the dancer’s audience of one, I have choices to make, real agency in determining how this work is realized: Where do I stand? Do I dance along with him? Do I watch every second, or turn away? When he runs, do I race to follow or lag behind? May I make eye contact? Should I smile? Can he feel the support and solidarity of my attention? How are we connected in this space, in this movement? And that’s the point, I suspect. 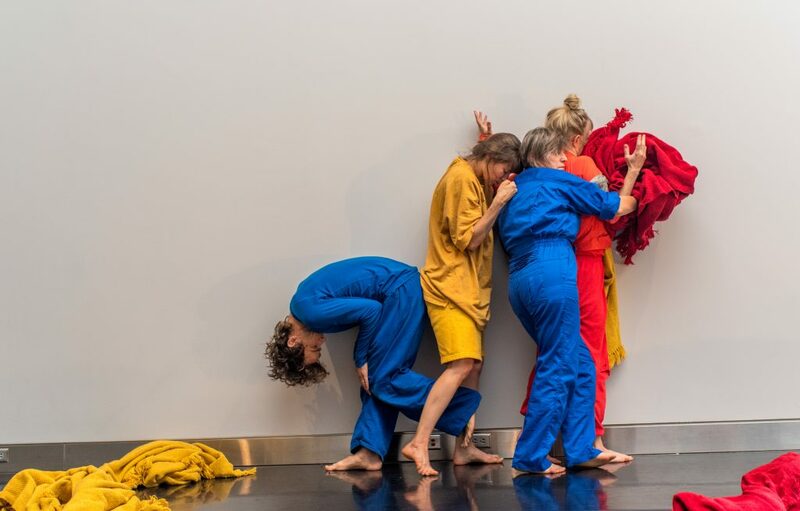 BodyCartrography Project’s latest experiment intentionally upends the usual contract between viewer and performer, eliminating the familiar sense of distance and anonymity that buffers the proscenium from those who watch in dark audience seats. closer is open-ended and discombobulating by design, intimate but also very public. I’m part of the action, but so are all the people who are doing the work of the city in the building around us – in choosing to avert their eyes or engage, they’re part of the show as well, witting or not. Susannah Schouweiler is a writer and arts critic, and editor-in-chief of Mn Artists.